Primary School (6 years) I was a student who didn’t understand what exams were when I was a young boy. Until my PSLE, that is. For some reason, I suddenly showed some semblance of brilliance during my PSLE. My result was 406 when the top score that year was 425. My parents were very proud of me then. Looking back, I’m glad that I had once made them proud. Secondary School (4 years) Anyway, my sec 2 results were not good enough for me to study ‘A’ mathematics in sec 3. I knew then if I can’t study ‘A’ maths, I won’t be able to do ‘C’ maths and ‘F’ maths in junior college. Then I may not have a good grounding for the engineering course which I had hoped to study in University. I may not even be allowed to choose Electrical and Electronics Engineering. My results in sec 2 would have defined my future life. I looked at my results on my report book then. I did a calculation. My maths result was actually 49.4 and the school rounded it down to 49. If it was 49.5, it would have been rounded up to 50 and I’ll be allowed to study ‘A’ maths and my future would be secured again. I took my report book and with thundering heart, approach the maths department head and appealed. I told her that I only missed the mark by 0.1. I begged her to reconsider. I was only 14 then. It was kinda unheard of at that time to approach the teacher yourself to make such a request. Many would have brought their parents or just give up. I did it on my own and managed to convince the department head to allow me to take ‘A’ maths in sec 3. Junior College (2 years) Soon, it was secondary 4 and my final year school results were not good enough for me to get into the junior college (JC) of my choice for the first 3 months. I got a score of 16. The JC that I managed to get in during the first 3 months, didn’t allow me to take ‘F’ maths because my results were too poor. The Economics lecturer also refused to teach for the first 3 months while we were there. She said that most of us would leave and go to another JC anyway when the GCE ‘O’ level results were released. She saw no point in wasting her effort. She was right. I had 6 points (for GCE ‘O’ level, the lower the better) and I would be accepted in any JC of my choice. I left and enrolled in one of the top 5 JC in Singapore. But in the new JC, I was strongly discouraged to take ‘F’ maths as I had missed many chapters for the first 3 months already. Because I wanted to study engineering, I knew I had to take ‘F’ maths for my own sake. Many other students dropped ‘F’ maths after the strong discouragement. I held on and struggled. Truth be told, the teachers gave good advice. I never did catch up with both ‘F’ maths and Economics which I missed during the first 3 months. At the end, my ‘A’ level result was not good enough to get me a place in Nanyang Technological University (NTU). The irony was that I passed GCE ‘A’ levels and thus I was not allowed to retake ‘A’ levels again in my JC. Instead, the students who failed their ‘A’ levels were allowed back in the JC to study another year before retaking their exams again. I was stuck. I was neither here nor there. I was in limbo. Days Of Being A Private Candidate (1 year) I knew my father wanted me to get a degree. He wanted me to be his son who has a degree among the sons of his brothers who had degrees too. I wanted to fulfill my dad’s wish and thus polytechnics cannot be my choice. I can either study in US college or retake my ‘A’ levels at the end of the year as a private candidate. I enrolled in a private school but also took my SATs and TOEFL. When my SATs and TOEFL results were released, I could have studied in US colleges but knowing that my dad would be struggling to support me financially, I kept the results to myself. It was tough being a private student. The private school was not really equipped to teach ‘A’ levels. In fact, we didn’t even have the labs to do our practicals for Physics. Fortunately, we had a teacher who worked hard and found us a secondary school which allowed us to use their labs at night. Unfortunately, secondary school lab was not really equipped for our practicals but beggars can’t be choosers, right? It was tough studying in the day and then attending practicals for two nights a week. But we cheered each other on. We all felt that we were the outcast of society, the rejected. Nobody will be giving us a chance but ourselves. I managed to enroll into NTU. University (4 years) During my second year, I flunked 3 papers and had to resit them. All my seniors told me that it was quite likely that I’ll only be able to clear 2 papers. It was quite unheard of to clear 3 supplementary papers. If I didn’t pass all 3 papers, I’ll have to retake the whole of year 2 again. I was worried but I just studied as hard as I could anyway. Miraculously, I passed all the papers. In my third year, my dad had a major stroke and slipped into a coma. He was the sole bread-winner of the family. My mom was distraught but she put up a brave front. I had to be strong even though I was emotionally weak. My dad finally managed to regain consciousness after 2 weeks but he was paralysed on the left side. His speech was slurred but he never felt sorry for himself. That’s the way my dad was. Strong. With the financial aid from my uncles and study loan, my family struggled on and I eventually graduated. My mon and dad attended my convocation. He was very happy. I was glad that I could fulfill his wish. Many years later, after my dad passed away, my mom would remark to me that she thought that my dad woke up from his coma because he was worried about me and my sister. He couldn’t just leave us to fend for ourselves then. After Graduation I rounded up my good buddies and we toyed with the idea of setting up an online portal selling CDs. We were very excited. We were all bitten by the dot com fever and we met at a cafe after work many days a week for many weeks. We even scribbled our ideas on napkins and behaving like wannabe technopreneurs. It was fun then, all the make-believe. We didn’t have the required technical knowledge to setup a portal so my friend invited another person into the group. He was supposedly good at web development. As he knew that we depended on his technical knowlege, he didn’t treat us like his equals; he treated us as though we were beneath him. Eventually, the enthusiasm just faded away and we stopped meeting. It was fortunate anyway that we didn’t start. Just a few months later, Napster would have swept the world by storm and it would have killed our start-up. But I did learn an important lesson: it is better to depend on yourself than others. From then on, I started studying about web development on my own for the next two years. I didn’t know what I wanted to do yet, but I knew the extra knowledge will come useful. I also didn’t want to depend on others again. Epilogue My wife would remarked one day that through my life, I never gave up when there were setbacks. I would just quietly soldier on. Maybe that’s the quintessential quality of an entrepreneur. If you are an executive earning $10k a month, you had a dream but you chose to give it up so you can keep earning $10k a month and more in future. That would be the price of your dream. If you were a poly lecturer making $5k per month but you gave up the job to pursue your dream of being a volunteer to take care of stray cats at a much reduced income. However, you are happier and derived satisfaction from the volunteer work. That would be the price of your dream. If you have a dream but currently you are working in a job to earn enough savings for you to realise your dream, even though you may or may not enjoy what you are doing now but that is the price you are willing to pay to realise your dream. What is the price you are willing to pay for your dream? What was the price I paid for my dream? I was an engineer making $40k a year. I risked it to develop a product which I thought would benefit and bring convenience to Singapore wedding couples. It took me 3 years before there was a sufficient revenue stream. So in terms of monetary value, the price I paid to pursue my dream was $120k. However, in actual fact, it may be more than that. Assuming a 30 years working lifespan with no increment, my economic value as an engineer would potentially be $1.2 million. If you were me, would you be willing to pay the price? I was lucky. I wasn’t intelligent as I didn’t consider so many factors. I attribute it to the brashness of youth. I thought my idea was going to be a runaway success so I just ran (pun intended) with my idea. I was naive. On hindsight, it wasn’t such a bad thing. Maybe I was also stupidly stubborn. I didn’t know when to give up. And I stupidly persevered for 3 years, so much so that I was almost unable to pay my bills. That was the price I was willing to pay. After 12 years. Now. Looking back. Have I gained more or lost more? Does success have to be measured that way? I would rather choose to contemplate and be satisfied by what I’ve gained. I’ve more time to spend with my family. I can spend more time with my wife. I’m able to see my children grow. I can be part of their childhood. I’m there for them when they need me. I can be more flexible with my time. Please do not be mistaken for a second that by doing your own thing, you have more freedom or more free time. On the contrary, you have less freedom and more stress as there is no moment when you are not worried about your venture. There isn’t a moment in time where you stop thinking how you can do better and how to outrun your competitors. I work longer hours. Many a times, I sleep for less than 6 hours. It is also a fact that what I’ve achieved can be lost in a whim and through no fault of my own. What made me do it then? I just had to know. I just had to know for sure if I can make my idea work and realise my dream. I don’t want to regret for the rest of my life if someone had successfully implemented a similar idea and it wasn’t me. I don’t want to be plagued by what ifs? If I had tried and failed, at least I would be satisfied with the knowledge that I wasn’t the better person to make it work. In that sense, I’ve also realised my dream, even though it was a failed dream. But at least, I’ve dreamt. I’ve lived. Do not blame Singapore or the people around you if you dare not live for your dream. Do not blame the society that it does not tolerate failures. The truth is that you don’t tolerate your own failure. There is a price to every dream. The question is: Are you willing to pay the price? Many years ago when I just started working as an engineer, I had an opportunity to attend a seminar organised by Intel in Penang, which was also where their factory was located. The seminar was related to the introduction of a series of new chips which will be using ball-grid array (BGA) arrangement. The seminar was to let us know how the BGA packaged chips may impact our printed circuit assembly process. As my ex-company was a large customer of Intel, up to four engineers were invited to attend the seminar for free, with flight tickets and hotel lodging provided. The procurement engineer from our company had included my name as he felt that I should attend as one of my future new product will be using BGA devices. We were to fly in on Friday morning, with Intel plant tour and seminar the next day. We’ll be back on a Sunday flight. The only thing I needed to do was get approval from my manager. I thought it would be easy since my department did not have to pay a single cent for me to attend. Boy, was I wrong! I met my boss at the factory floor with the machines nosily pounding chips onto printed circuit boards. When did Intel start making boxes? “But boss, I really think I should go, it is related to my work.” I can feel my temper rising but I spoke with a controlled tone. “No, you can’t do it.” He insisted. A short shouting match ensued but it was drowned out by the assembly lines so no one overheard our ‘conversation’. “Fine. Ok. I won’t go. Happy?” I stormed off. Two weeks later, I applied leave knowing that my boss would have forgotten the exact dates of the seminar. As expected, he approved my leave. I bought my own flight tickets to Penang making sure that I am on the same flight with the other engineers of my company. I’ve arranged to ‘bunk’ in the room with a colleague whose boss of another department had approved his attending the seminar. I was glad that I attended the conference. I learnt something that was related to my work. In fact, it gave me a better understanding and I was able to have a better appreciation of the problems related to BGAs in the later months when one of my new product started using BGA chip devices. In fact, I thought that the knowledge was important enough that I actually conducted a short and concise introductory course to my fellow engineers in my department – minus my boss, of course. Ever since then, if I ever come across any arguement simply stating that “it cannot be done because it has not been done before”, it would really irk me. Did I regret my decision? No. Did I break rules? Maybe. Don’t ever let people convince you that you can’t do it because they can’t. Don’t limit your potential based on other peoples expectations. Realise your own potential. Believe in your dreams. You have yourself to answer to. P.S. The title of this post was inspired by Neon Genesis Evangelion. I forgot about the birthday not because I no longer view it as a milestone. No, it is still an important date. A year forward, is a year survived and I’ll always count my blessings. A year survived, is another year the company had provided for myself, my family, my staff and their family. It is especially gratifying as it was a tumultuous 2011 and winter is coming. Running a company is not easy and it is only going to get worse. If you’ve noticed, the technological cycle and change have gotten quicker and shorter. In two short years, with the introduction of the iPad, the netbook category was totally decimated by Apple. Similarly, the Wintel PC companies have no response to the market share gain by iPad and the sales of Wintel PC and laptops have languished. In two short years, giants like HP and Dell have been chopped off at the knee by the Apple sword in one clean strike. These are the worries that keep me awake at night. For my company’s sake, I always have to be vigilant. I can’t allow my company to fall during my watch. I am responsible for my staff. I forgot the birthday simply because we were all too busy. We had a company offsite meeting at the end of last year. We have been very focus in implementing the ideas and plans that we had from the meeting. We became a GST registered company in 2010, not by choice but was mandatory by law. That’s because our company revenue had crept past the one million dollar mark. In 2011, even under tough environment, we managed to keep our revenue passing the magical one million dollar mark. 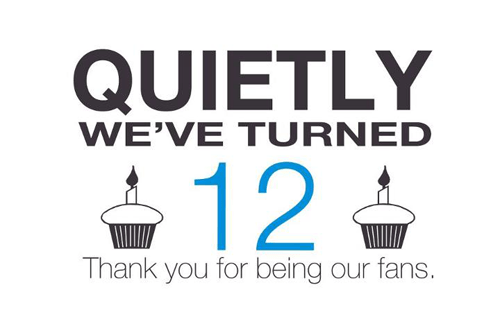 I guess, from a one man show started 12 years ago to the current company with 12 staff, we do have much to cheer.